The ALV Laser Welder is a compact device that can be set up in any work area. 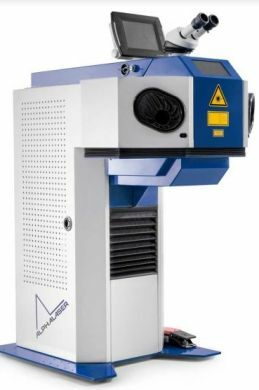 The ALV Laser Welder is designed for use in micro and deposition welding in tool and mold manufacturing, in sensor production and medical technology. The welding process takes place in a closed, laser-safe working chamber and the movement system can process workpieces up to 50 kg at a high level of precision. The ALV offers a large vertical movement range and doors that open wide so that larger workpieces can be welded. In just a few steps, this closed system can be converted to an open laser system for processing larger or longer components. The ALV's joystick moves the workpiece within the working chamber, or automation can be used. The large vertical motion range of the workbench also allows for welding on larger workpieces. The ALV has 3 linear movement axes, and the vertical Z axis lifts up to 50 kg. A rotary axis for processing cylindrical parts is also available. The simple to program WINLaser NC Software for 4 axes makes fully automatic welding for production of small batches possible. It is exceptionally useful particularly in work involving medical technology, manufacturing sensors, and for smaller workpieces in tool and mold manufacturing. It is available with a wide range of ND: YAG or Fiber Laser Sources and provides laser power of 100 to 450 watts.